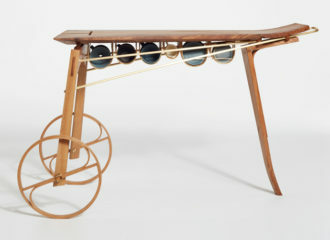 Hugh Miller is an award winning contemporary applied artist specialising in studio furniture in wood. Hugh trained as an architect, and sees his work as small pieces of architecture, where the concept is embedded in the intricacy of the detail. Hugh’s work is based on a set of design principles, developed during his Churchill Fellowship in Japan in 2015. Made in English elm and brass, Hugh’s work explores contrast: between texture and smoothness; between hidden and visible; between plane and lath; and between lightness and solidity. These contrasts illuminate the duality of Japanese and Western cultural influences that underpin his work. Hugh’s latest collection, titled ‘The Coffee Ceremony’ uses the everyday ceremonies of life in Japan as the inspiration for developing an everyday ceremony of his own – the ‘coffee ceremony’. Within this context, the process of making the pieces and the process of making coffee emerge as the same: both are ceremonies of making.